As some of you know, part of my trips involve writing up the different street foods I try. Istanbul offers several excellent examples of street foods but unfortunately I didn't take any pictures of them. Different kinds of Doner kebabs are the best known examples, but I also had a couple of other things, such as simit, açma and balık ekmek. 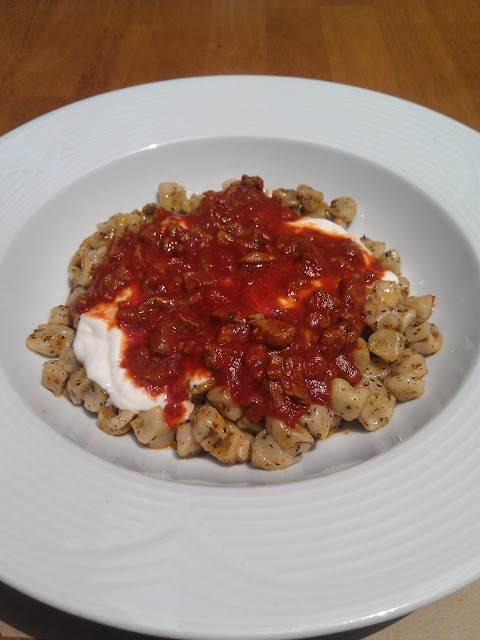 While it is not a street food, the one dish I did take a picture of is Manti, which is also known as Turkish ravioli. Manti are very little pasta dumpling which are served with garlicky yoghurt, tomato sauce, seasonings and melted butter. The manti I had also came with pieces of beef if I remember correctly. Now I am normally not a big fan of yoghurt on other foods, but manti was pretty good. As a word of warning, I had this dish at a restaurant at Istanbul Airport and I got the impression that they did not serve the most traditional versions of Turkish dishes. So if you have manti, it may look different to my pictures.